When Gejo of Malipayon farms texted his weekly list of available produce, I noticed his mexican cucumbers were back. 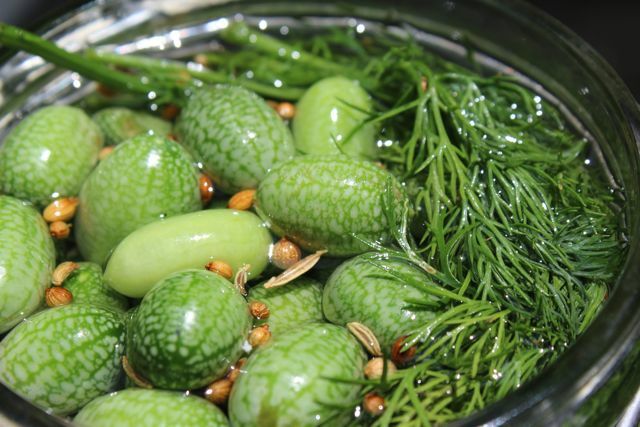 These cute, unusual little cucumbers were an oddity last year, and I featured them here, and I wanted to see if they would make decent pickles, so I ordered half a kilo’s worth. I also ordered a lot of dill along with my other herbs and greens. First we washed the cucumbers thoroughly and set them aside. Next, I made a light pickling liquid with water, rice vinegar, salt, sugar and let this dissolve over a medium flame and then let it cool until just warm. You can use this recipe for a guide to proportions of ingredients. You may choose to add a little more salt if desired for these cucumbers. I also added about a tablespoon of pickling spice, a selection of seeds and spices, to the warm liquid to infuse it with more flavor and aroma. 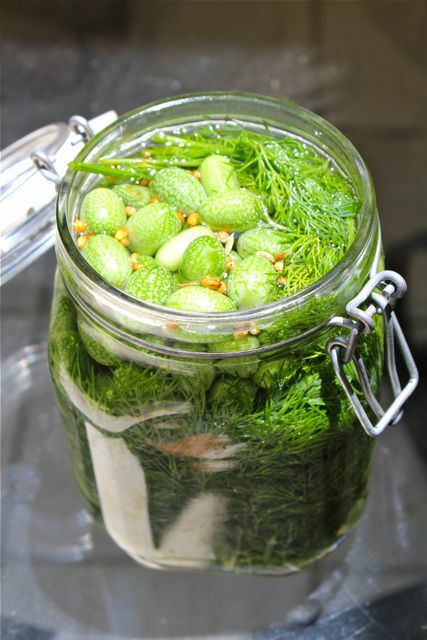 Place the small cucumbers in a large jar, together with a copious amount of dill, and pour the warm liquid over the cucumbers. Do not pour the liquid in when very hot, they will cook and discolor the skins of the cucumbers faster than they should. 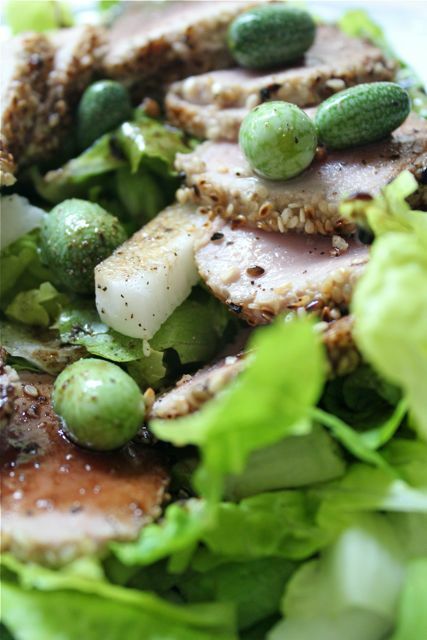 I added some of the mexican cucumber pickles to a salad of greens, topped with seared tuna, and it worked really nicely. I can see how these would make terrific garnishes for lots of other dishes as well. Pretty pictures. Second pic looks like a plate of edamame. I would like to see how the color turns out once the pickling is done. Dill is just one of the multitude of culinary herbs I never came across until I came to Canada. A German colleague introduced me to boiled new potatoes shaken with dill, butter and sour cream as a side for grilled steak. Yum. And this food discovery also goes for dill pickles, all I knew were mixed sweet pickles and of course, burong manga and mustasa. Wow! I would love to try this! Thank you for sharing, MM! That is great, first time to hear mexican cucumber. I have not seen any of this here in local market in metro manila. I will try another substitute. Looks delicious. Very interesting! It’s a novel way to add visual interest and some crunch factor to any salad or side dish. Thank you for continually experimenting, and for sharing the results with us. Thanks also to such ventures as Gejo’s for introducing new things to our food experience. i am just wondering, if these mexican gerkins are the same with the mini-cucumber like fruiting vine in our garden though, the color is dark green. every time i squeeze one fruit, it resembles the smell of fresh cucumber but i haven’t tasted it yet. So that’s what they are called. A lady at the Sta Monica market in Puerto Princesa makes a nice sauce using these cukes , sea weeds and fruit vinegar as ingredients . What a shame that her product can only be made in small quantities and is not enjoyed by a wider following. I love it with the traditional lechon instead of the Mang Tomas kind. I saw these cucumbers a couple of years ago at Centris Sunday market. A little goes a long way in a salad, great burst of flavor when you bite into it. Gejo grows the most amazing plants! MM, your sesame encrusted tuna salad looks lovely. Is that pickled singkamas peering from beneath the tuna? Mexican groceries abound my neighborhood, pero hindi ko pa ito nakita. Siguro sa wet market ko ito matatagpuan. Punta ko ng weekend at as usual, gayahin ko ang ginawa ni Mr. MM. Daghang salamat, ginoo. cumin, yes, pickled singkamas with the tuna salad. ConnieC, that sauce sounds wonderful. Roderick, I got these specific jars in Divisoria, at Sin Kiang Heng. But you can find similar jars at SM Home Dept, or Landmark housewares dept., etc. These cucumbers look like tiny watermelons. May I know where Sin Kiang Heng is in Divisoria? Monty, they are also called Watermelon Cucumbers in some seed packets and websites. MM: Will try to get you some the next time I go to Puerto Princesa and chance she has some stock in her shelves. 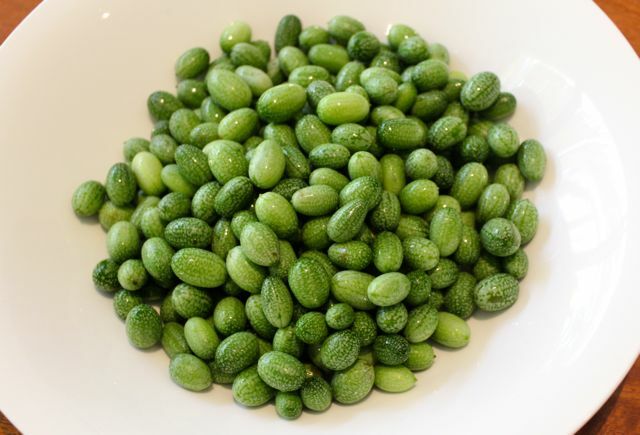 The sauce goes well with many fried or grilled dishes or makes a nice salad dressing, as in cuke sauce on cukes. 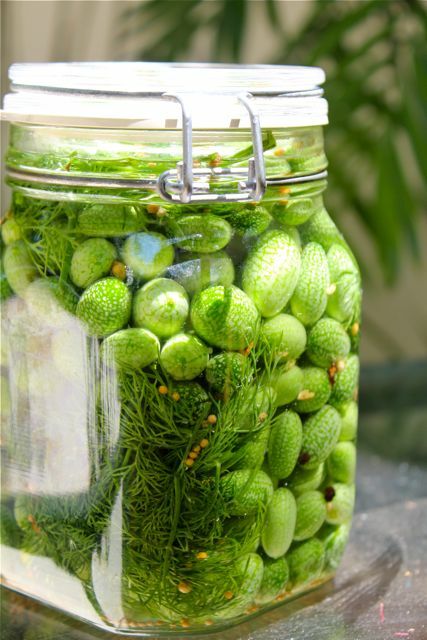 I got to get me some of those cute cucumbers and make my own cornichon!